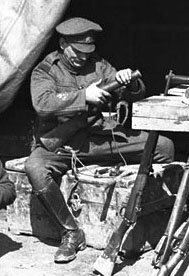 I was doing a search online looking to find images of the Lewis machine gun on its anti-aircraft mount. I came across these two images (the third one is simply cropped) of an armourer's workshop in the field. 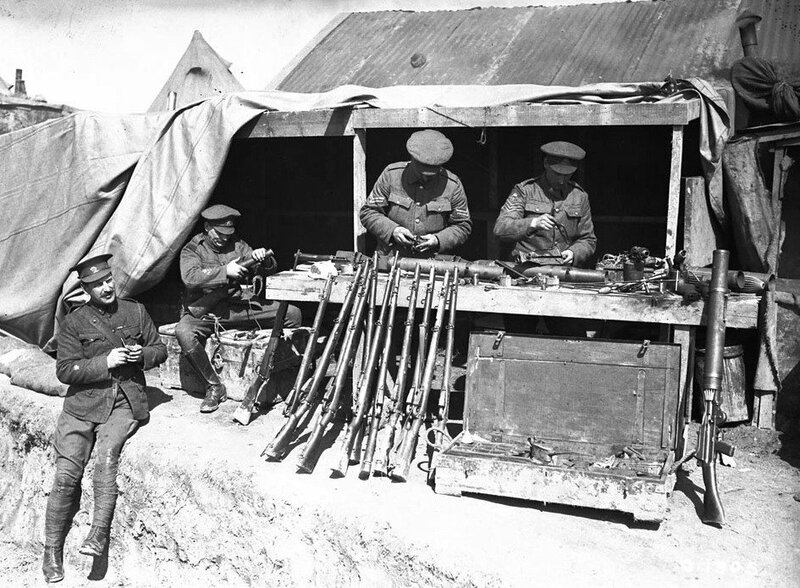 You can clearly see them working on Lewis machine guns with the guns in various stages of assembly and disassembly. Also visible is a stack of Lee Enfield rifles waiting their turn. What really caught my eye was that the chap sitting on the box was holding a No.1 Mk.1 flare gun with the shoulder stock and with a piece of rope as a makeshift sling. This is the only image of this flare gun in a wartime setting that I have ever seen, and I just wanted to share it with the forum members, who may be interested. Also of interest is the light railway track running alongside. 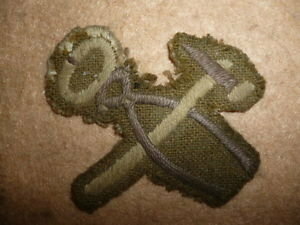 In the cropped picture, can anyone identify the insignia on the soldier's sleeve? As per Dave, wonderful photos. Of the rifles propped up, all but three appear to be SMLE’s; what are the three which have a barrel that protrudes well beyond the woodwork? Fascinating. The far left man with medal ribbons appears to be a warrant officer. Second left may be an RQMS equivalent. Any comments please? The odd rifle out (centre of stacked rifles) appears to be a German Gewehr 98 Mauser rifle. It is the one without the protruding magazine and with the protruding muzzle.! As far as I can see all the other rifles are British SMLE rifles. Thanks for that, but there are clearly three with barrel protruding beyond the rifle’s furniture. 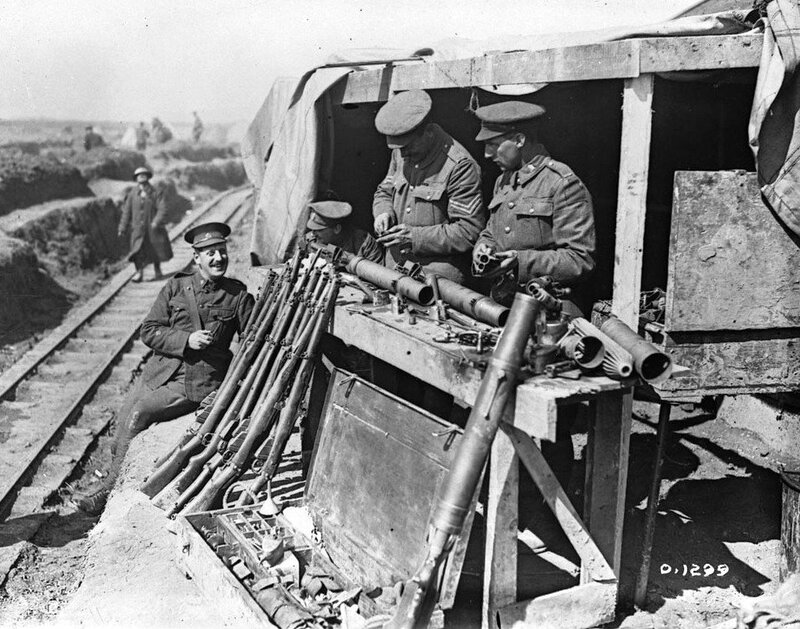 Two are stacked in the midst of the SMLE’s, while the third is in front of the soldier holding the flare gun. I think you will find that there is only the one rifle (Gewehr 98) with a protruding muzzle in the lineup leaning against the bench at the front. The other rifle tucked around the corner (partially obscured) I believe is also a SMLE ... but with damaged or removed forestock woodwork. I agree with this analysis. I see only one non SMLE amongst the rifles. And Mark - unrelated, but I noticed your avatar and thought you might like to see my Rifle Brigade formation patched helmet cover, named inside too with service number to Pte.Benjamin Baldrey.